Here’s a list of the 15 best kinds, ideas, and recipes we’ve come across in our search so far! Are you interested in having a cake that tastes quite simple in the sponge department because you love a good, classic vanilla sponge, but you’d love a strawberry filling and some good bites of fruit in there somewhere as well? 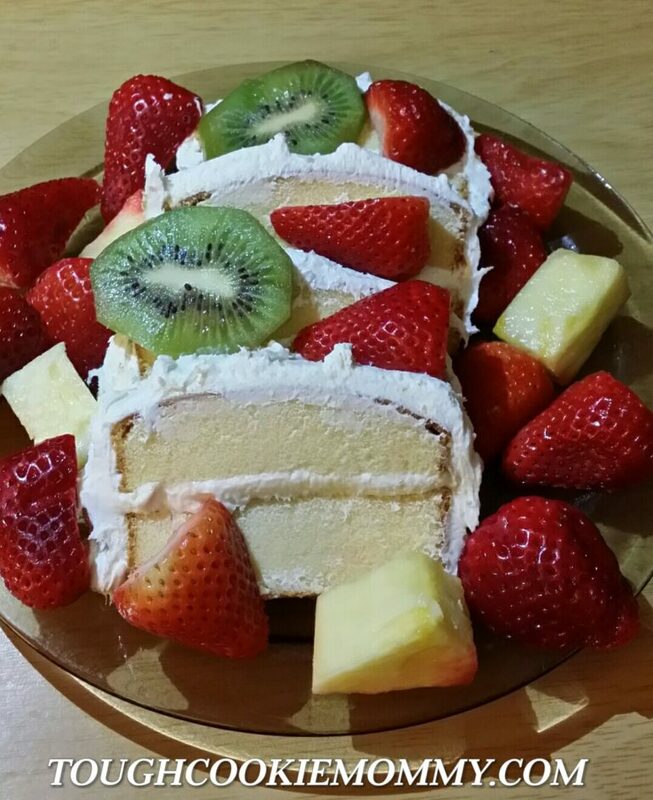 Then we’d absolutely suggest a good strawberry chiffon cake! 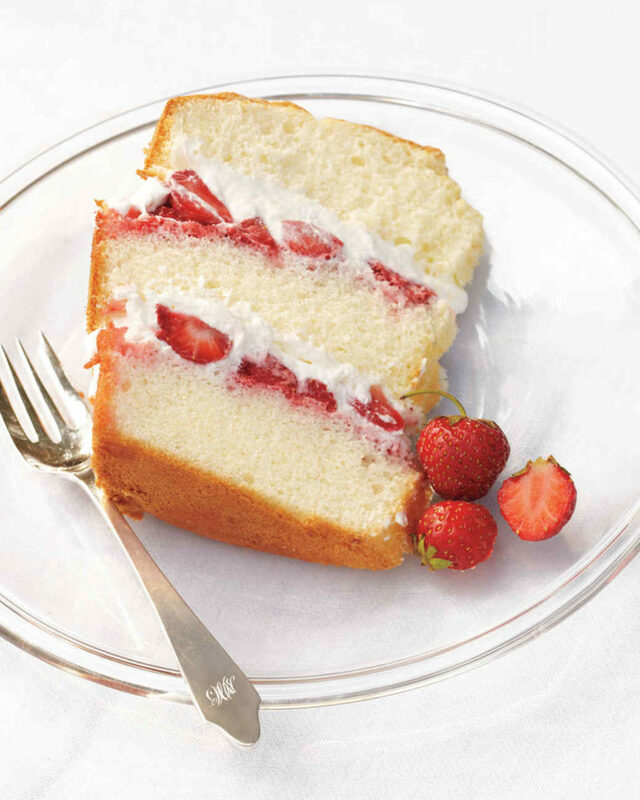 Martha Stewart guides you through the process of making a subtly sweet sponge cake with a sweet cream filling in the centre layer and slices of fresh strawberries nested in their as well. Are you the kind of cake lover who enjoys trying a different texture every once in a while, just to keep things even more interesting than they are when you’re just playing with fruit flavours? 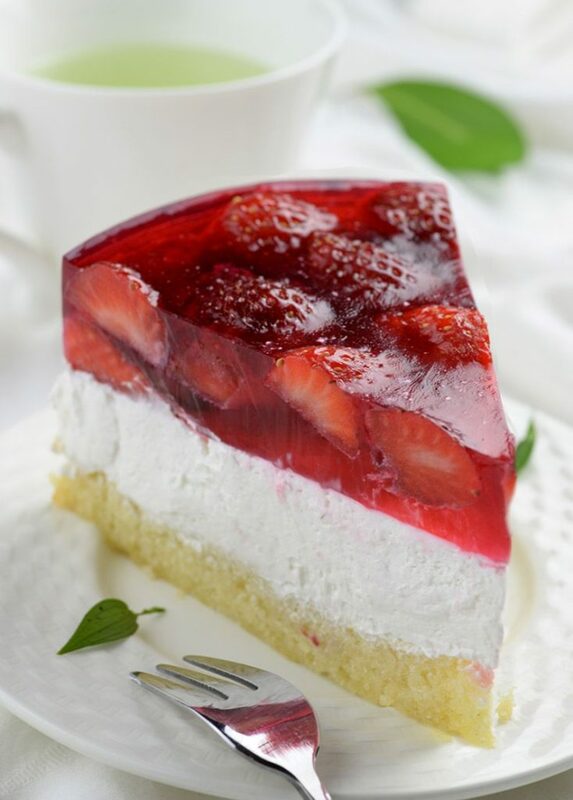 Then here’s a totally unique and interesting recipe from Oh My Goodness, Chocolate Desserts that has a cheesecake-like bottom layer, a sweet and creamy centre, and a top layer of strawberry Jello featuring whole fresh slices of strawberries! 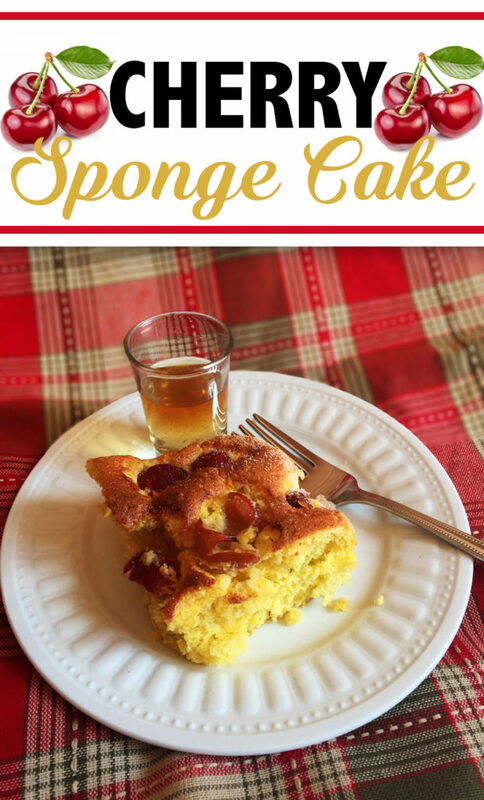 When we first read the term “cheery spongecake”, we first thought that this recipe would be a simple, bouncy sponge that’s actually flavoured like cherry. Instead, we discovered that Better Baking Bible had actually included whole pieces of cherry in their dense, nearly dessert bread style cake! This recipe is already sweet enough that you can absolutely eat it as is, but we’re actually such sweet lovers that we make icing or glaze to drizzle or smear it with. If you’ve never had baked sweet treats involving edible flowers, we’re sorry to tell you that you have been missing out all these years! Few things make us feel quite as in the mood for spring as a good fruity recipe that involves florals as well, whether that’s in the flavour or simply the decor. Luckily for all of us, this amazing recipe that we found on The Hungry Australian gives you both of those things! 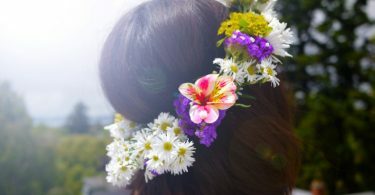 Their tutorial guides you through the process of making layers of light, fluffy spongecake, filling them with a delicious cream spread, and topping the whole thing with with all kinds of berries and accenting it with adorable edible flowers. They used blueberries, cherries, and whole strawberries, but you can get creative with whatever you like best! If you’re going to make yourself a deliciously fruity cake from scratch, would you prefer to make something absolutely decadent and totally rich tasting? 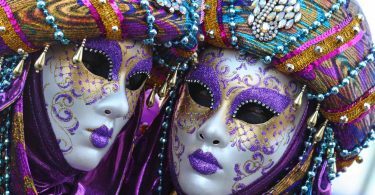 Perhaps you’re actually just a massive chocolate fan and, while these lighter ideas certainly look yummy, you’d prefer something that’s heavier on the cocoa. In that case, we absolutely think you should take a look at this fantastically delicious recipe from Dagmar’s Kitchen. 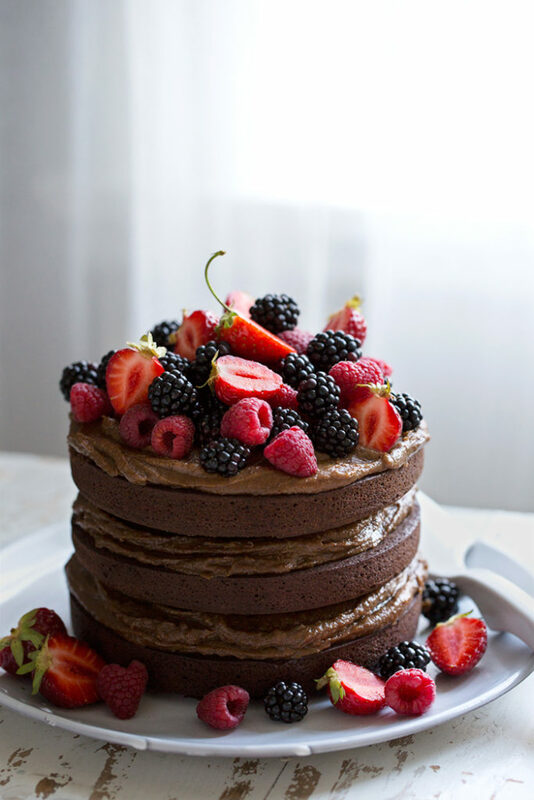 They show you how to make a “crazy” chocolate cake covered in mixed berries and drizzled in a salted caramel espresso glaze and it is nothing short of amazing. “Mess cake” is another one of those amazing recipes that, if you’ve never tried it, we’d absolutely encourage you to grab the ingredients for right now. It simply must be tried! 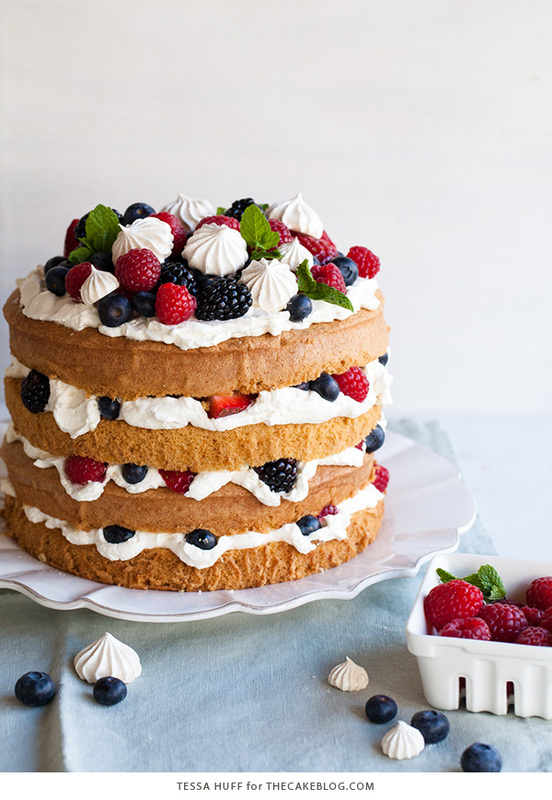 This recipe involves creating a high tower of delicious layers of sponge with sweet cream in between each, as well as not only mixed berries but also tiny, adorable meringue rosettes! Find out how all of these things are made and put into incredibly scrumptious combination on The Cake Blog. Are you perhaps very here for the idea of of creating very unique flavour combinations that you wouldn’t necessarily find on the average cake menu but that’s basically worthy of being featured in a gourmet shop? 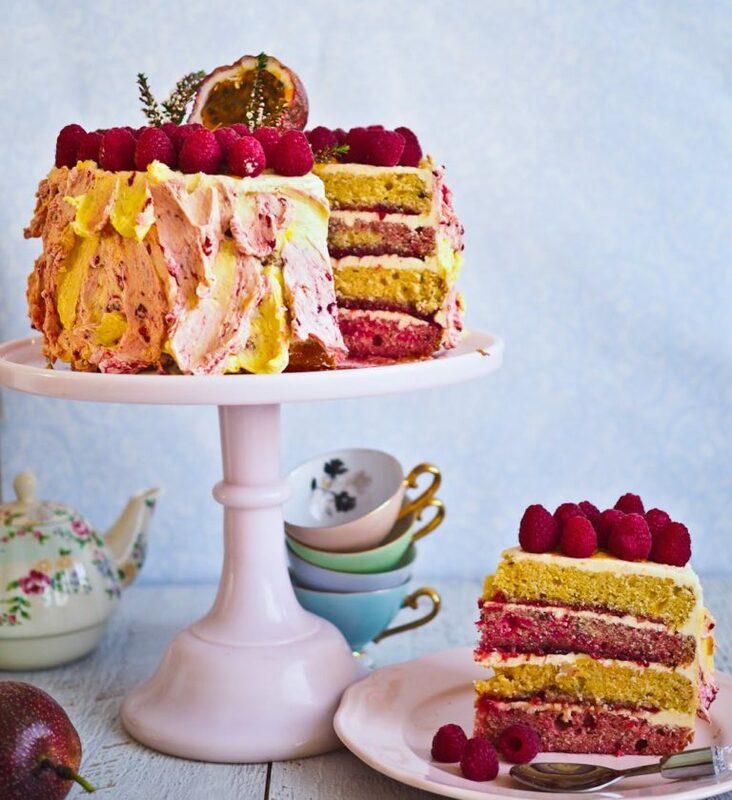 Then we are excited to present to you this fantastic passionfruit raspberry layer cake outlined on Not Quite Nigella! 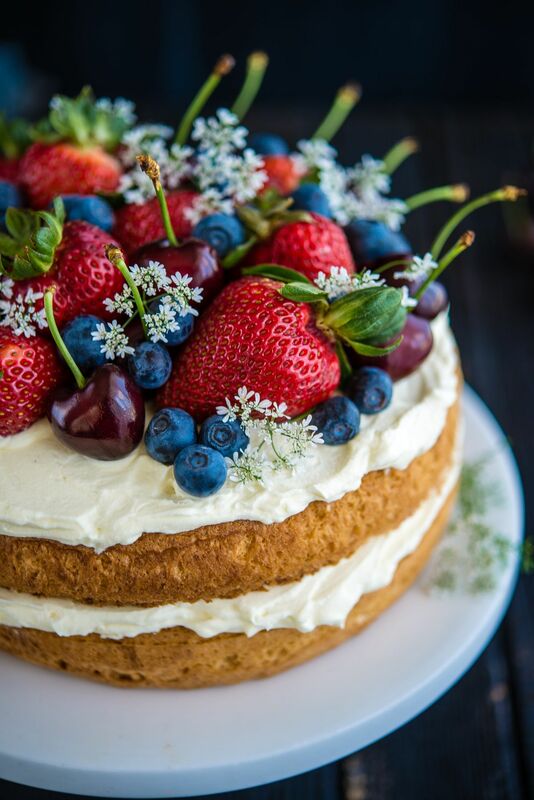 The cake itself is jam packed full of flavour, the icing brings even more to the table, and you can take things to yet another level by putting fresh berries on top. Perhaps you’re actually quite experienced at baking cakes and you’re looking for a very professional and delicious tasting recipe that will test your skills, give you a fresh spring taste, and help you impress your friends and family on a special occasion? In that case, we think you might be the perfect person to try making this fantastically tall cake recipe from Butterlust! 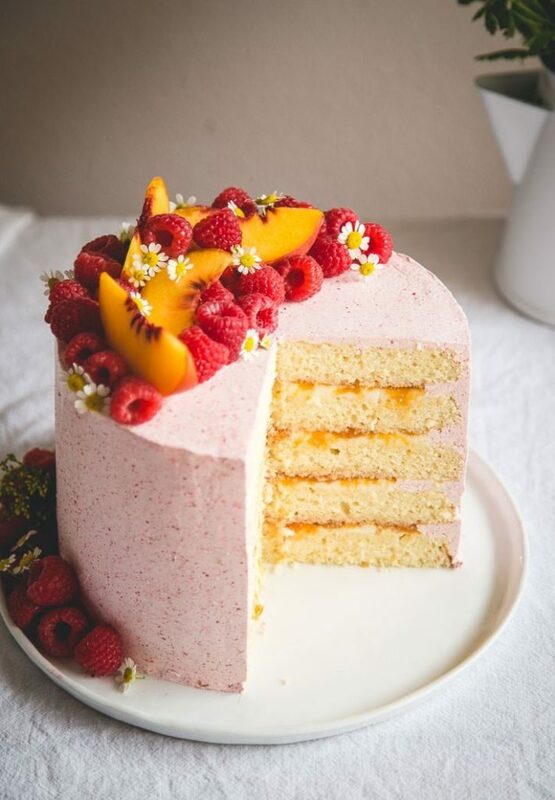 Their tutorial teaches you how to make an almond cream cake with peach, mascarpone filling, and raspberry buttercream that tastes nothing short of divine. Are you feeling very into this whole raspberry combination cakes idea but you haven’t seen one that’s quite grabbed your attention enough to try it out yet? Perhaps you actually just need more raspberry ideas because you love them so much! Either way, here’s another delicious cake idea for your consideration. 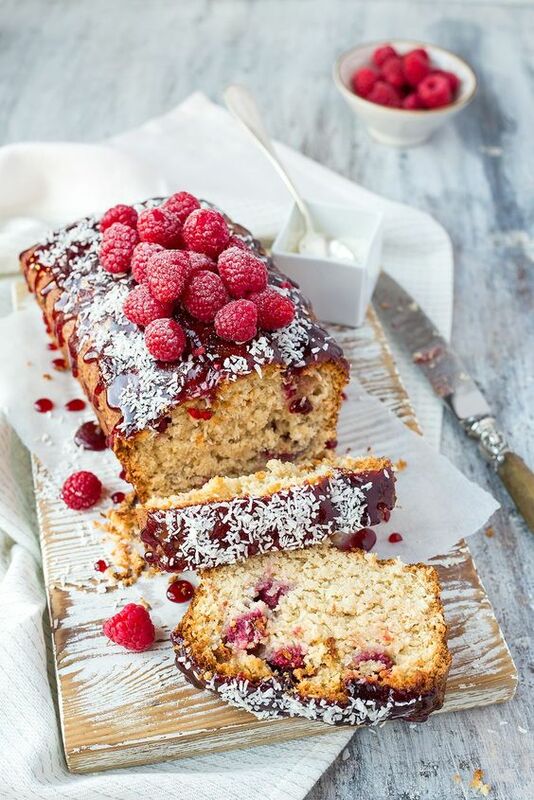 Check out The Kitchen Alchemist to learn how this fantastic raspberry coconut cake that’s a little more along the lines of a dessert loaf is made. Sometimes, the best fruit and berry cakes to ring spring in with are cakes that actually already exist as plain classics, but you’ve just added berries on top. 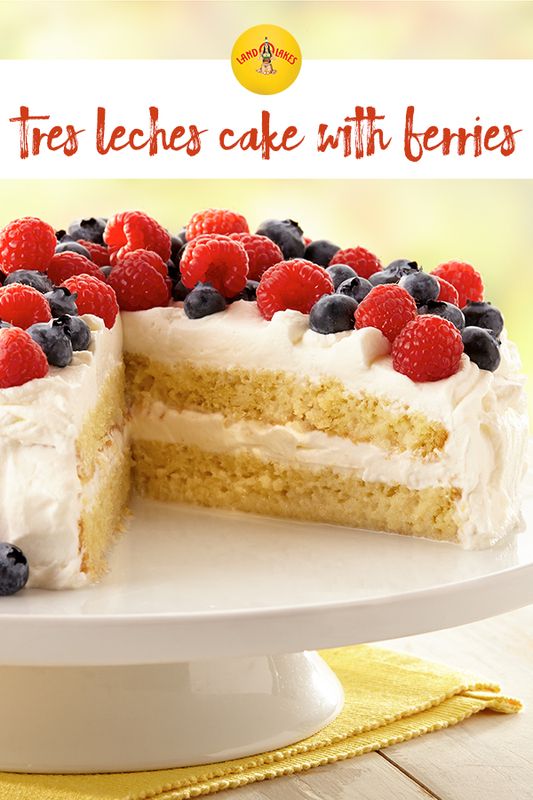 That might not sound true compared to some of the absolutely decadent fruit flavoured cakes we’ve shown you here so far, but this tres leches cake covered in berries is the perfect example of what we mean! Get the full instructions for making your own on Land O’ Lakes. We’ve talked a whole lot about fruit recipes that are actually mostly berry based recipes so far but when it comes to classics that you can dress up using fruit, here’s another awesome idea for your recipe book thanks to Tough Cookie Mommy! Their recipe guides you through the process of making a delicious classic poundcake, adding a creamy icing, and topping it to your heart’s content with whatever fruit and berries you like best. Are you still thinking about how much you love the idea of fruit cakes that use raspberry as one of their fruit and berry combinations, but your favourite baked treats are actually usually citrus based ones like lemon cakes and loafs? 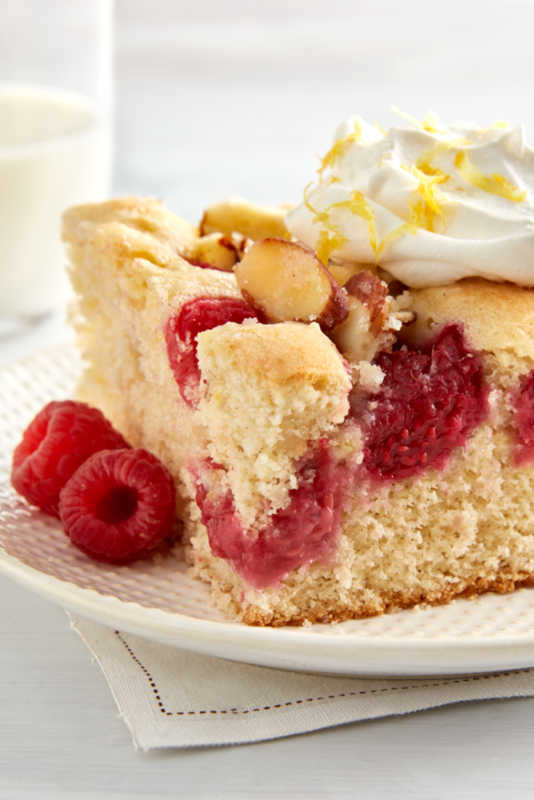 In that case, we absolutely think you should take a look at this fresh tasting, flavourful raspberry lemon cake recipe from Egg Land’s Best! Perhaps you’d actually rather try something a little lighter than a dense sponge cake covered in icing but you still need it to be fruit heavy because that’s the whole reason you’re making cake in the first place? Well, if you’re still looking for something that will test your skills in the kitchen, then perhaps it’s time to try your hand at making pavlova! 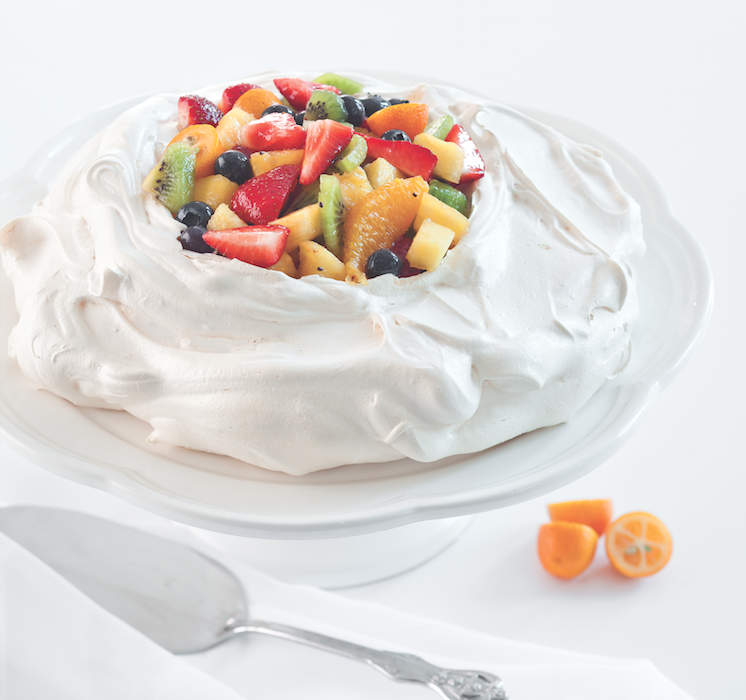 This recipe from Celebrate Mag shows you not only how to make a pavlova in a surprisingly simple way but also how to form it so that it’s got a centre you can fill it with all the fruit you want! We’ve talked about lemon recipes and we’ve talked about about passionfruit recipes, but what if you immediately started wishing that you could combine the two to make the ultimate spring fruit cake? In that case, we’ve found the ultimate cupcake experience for you! Check out how Annie’s Noms made these fantastic lemon passionfruit that are tangy and full of flavour. Just in case you’re still thinking about combinations that you’ve seen separately but would really like to try together in one cake recipe, here’s one last try to get the delicious recipe you’ve been hoping for! 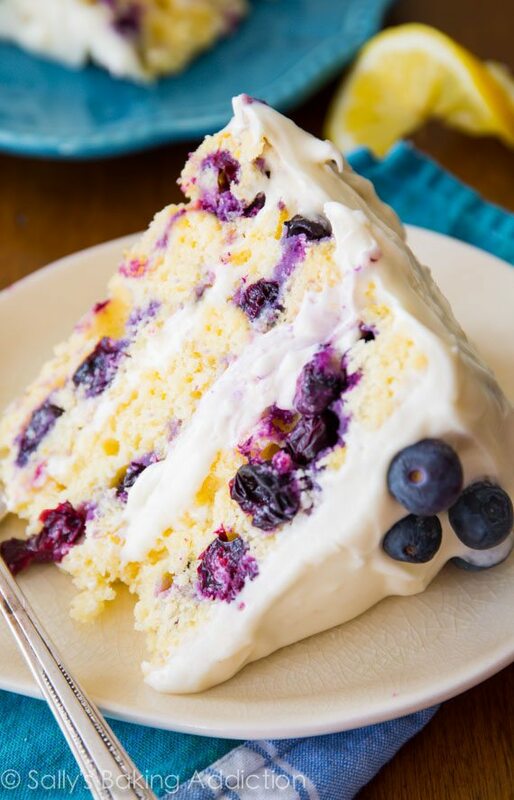 Sally’s Baking Addiction guides you through the process of making a delicious blueberry lemon layer cake that’s full of all different textures and fruit flavours that can only be described as perfectly refreshing. Do you have another favourite fruity summer cake recipe that you make all the time and that your family absolutely adores but that you don’t see on our list? Tell us all about it or link us to the recipe in the comments section!